“The Debate and Its Prelude” from Christian Faith Publishing author Jeffrey L. Romine, Ph.D., is an impactful work of fiction that takes concepts from a biblical framework of knowledge, as presented in the author’s nonfiction book “Knowledge unto Relationship: A Biblical Destiny,” and introduces them to a wider audience. “The Debate and Its Prelude”: an engaging discussion of the biblical and philosophical concepts of knowledge, as seen through the lives and conversations of fictional characters debating opposing sides. “The Debate and Its Prelude” is the creation of published author Dr. Jeffrey L. Romine, a former medicinal chemist turned writer. Dr. Romine employs believable characters in high-stakes educational situations to convincingly set the stage for his arguments, and in doing so, throws not just light but knowledge onto the ongoing great conversation that may have started long before the debate came to be. View a synopsis of “The Debate and Its Prelude” on YouTube. Consumers can purchase “Then Debate and Its Prelude” at traditional brick & mortar bookstores, or online at Amazon.com, Apple iTunes store, or Barnes and Noble. 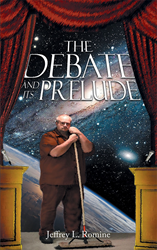 For additional information or inquiries about “The Debate and Its Prelude”, contact the Christian Faith Publishing media department at 866-554-0919.